GPS just keeps on giving… I seem to find out about more mathematics in GPS all the time. Einstein published his theory of special relativity in 1905, and a (more mathematically difficult) theory of general relativity in 1915. Special relativity predicts that clocks in orbit around the earth will tick slower than our clocks, by about 7 microseconds per day. General relativity predicts that clocks in orbit will tick faster than our clocks, by about 45 microseconds per day, if you do your curved space-time calculations correctly. Put together, the net effect is that clocks in GPS satellites would go about 38 microseconds faster per day than our clocks. If this error were allowed, it would quickly lead to huge errors in GPS readings. Errors of only 20 nanoseconds are allowed (1 microsecond = 1,000 nanoseconds). So apparently GPS clocks are designed to compensate for the effects of Einstein’s theories of relativity. In other news, just today there is a post on BBC about an up and coming use of GPS. Your mobile phone transmits your GPS received location to your phone company all the time. When you are near a shop, you will receive a text message from your bank saying you can borrow money at a low low rate! So you can go ahead and buy that new coat. Targeted offers based on your location will be big in the future, and they are already here, in fact. The Turkish are good at these algorithms. This continues my previous post about GPS tracking. It’s interesting to note how many different ways tracking is being used at the olympic games. During the cycling at the olympics it was reported that so many people were tweeting and sending photos and video that the GPS tracking on the cyclists was jammed. This is not quite correct. The TV broadcasters (the Olympic Broadcasting Services) were supposed to have GPS tracking so they could see how far behind the leader each cyclist was. I’ll assume you read the post below about GPS tracking. I think what happened here is that the cyclists had GPS transmitters, which were sending the GPS data to the TV broadcasters via a mobile phone network. So many people on the cycling route were downloading or uploading video and photos, and sending tweets and texts, that the mobile phone network was pushed to capacity and some of the GPS data was delayed. According to the Guardian it could have been avoided – this article tells you who blames who. Added: GPS tracking was also used in sailing. Every boat and buoy had a GPS transmitter, and the positions were constantly tracked and portrayed on a screen that TV viewers could watch. Viewers could watch the positions change by the second. The company employed to provide this service is named Swiss Timing. I don’t know how they gathered the signals, maybe they used local mobile phone masts. 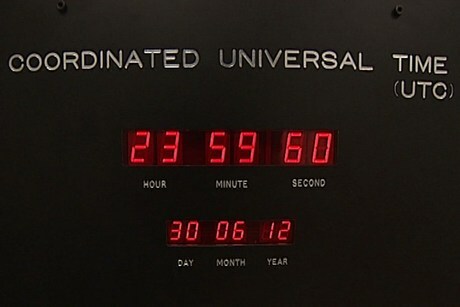 On 30 June, at 23:59:60 (00:59:60 BST), an extra second was added to Coordinated Universal Time (UTC). This is what is known as a leap second. 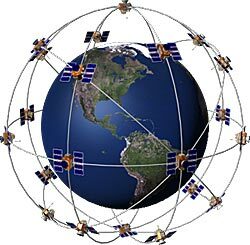 I posted earlier about GPS and how GPS time (determined by the atomic clocks in the GPS satellites) is now extremely important to the world. I wondered how GPS time accounts for leap seconds. The answer is: it doesn’t. However, GPS does provide UTC by transmitting the necessary data about leap seconds in its signal so that UTC can be calculated from GPS time by a GPS receiver. I read about this here. My previous post about GPS started me thinking about GPS tracking as opposed to GPS receiving. We’ve all seen James Bond films where he plants a tracking device on a car, and then he can follow the car. In the old days tracking wasn’t done using GPS, but now it is. Company X that supplies GPS tracking devices must have a way of collecting the GPS data. I don’t know how this happens. The tracking device has to transmit the GPS data to somewhere. This could be sent to the nearest mobile phone mast, I suppose, and company X has to pay for that. Perhaps it could be sent to a satellite – for ocean going yachts and ships this must be what happens. This satellite is not a GPS satellite, I presume, it is a satellite owned or rented by company X. The mobile phone angle is interesting, because most mobile phones now carry a GPS receiver. What if company X is itself a mobile phone company? Then company X automatically has the capability to receive the GPS data that the GPS receiver in your phone is receiving: your phone could simply transmit this data to the mobile phone company via the nearest mast. This might happen without us knowing. I don’t know for a fact if this happens or not, but I suspect it does. Maybe we agree to it in the fine print. I have no idea what a mobile phone company does with that data, but I would like to know. The US Supreme Court recently issued a ruling on whether law enforcement could place a GPS tracking device on a suspect without a warrant. “We hold that the government’s installation of a GPS device on a target’s vehicle, and its use of that device to monitor the vehicle’s movements, constitutes a ‘search,’” they wrote. The question “does the government need a warrant to track my location in real time via my mobile phone” appears to be unclear legally in the US. I would like to know the legal situation in Ireland. There will come a day when all cars have GPS trackers and speeding tickets will be handed out thanks to GPS. Think of a simple example. Suppose you are driving on a motorway and you are recorded in one location at a certain time. Suppose there is a speed limit of 120 km/hr. If the GPS tracker in your car shows you to be 130km down the road one hour later, then this is conclusive proof that you broke the speed limit. Therefore you can be sent a speeding ticket in the post. Actually, this could already be done using the cameras at toll booths, which have clocks on them. Big brother, etc. My last post started me thinking about the GPS system. What is GPS? GPS stands for Global Positioning System. It is a collection of satellites orbiting the earth, and each one transmits a signal back to earth. Back here on earth, you can buy a device that receives these signals from several different satellites. Your device then calculates its four coordinates (three space coordinates and one time coordinate) using geometry. You then know where you are, and what time it is! To work out where you are, your receiving device needs to know two things: The location of at least four satellites above you, and your distance from each of those satellites. 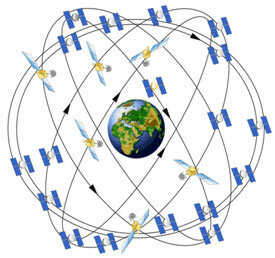 The locations of all satellites are stored in the memory of the GPS receiver, and updates to the locations are contained in the received signal. The distance to a GPS satellite is worked out using the time it takes the signal to travel to the receiver from the satellite. 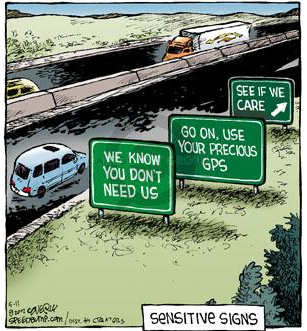 Apparently our society is becoming very dependent on the GPS system, in unexpected ways and in ways we don’t realize, according to a report last year from the UK Royal Academy of Engineering. Data networks, financial systems, shipping and air transport, agriculture, railways and emergency services, along with satnav systems, all use GPS. There are many applications that were not foreseen. There is a danger if we now re-design a system to rely on the GPS signal. There should at least be a backup in the event of GPS failure. This also means that whoever operates the GPS system can bring down those other systems, simply by turning off the GPS transmissions, or by increasing the error. Part of a GPS signal is the time. The time coordinate is often overlooked. Many applications such as satnav only use the space coordinates. However the GPS satellites have very accurate atomic clocks, so the time transmissions by themselves have proved to be very useful. For example, wireless networks use GPS time at their base stations to synchronize them. I’ve read that GPS is now the world’s main supplier of accurate time. If you are moving then your GPS receiver can work out your speed. Your speed and direction of motion can be calculated from your exact position now, and your exact position 5 seconds later (say). All four coordinates (space + time) are needed, because speed = distance/time. How does your GPS receiver know which signal came from which satellite? There is some interesting mathematics programmed into the GPS receiver to enable this. What happens is that each satellite transmits a code as part of its signal, called its pseudo-random code (PRC). The receiver is able to use these PRCs to distinguish the various signals from different satellites, by calculating something called the correlation. The correlation properties also allow for signals bouncing off buildings and other objects. The European Union is developing its own GPS system, known as Galileo. Russia and China are also developing their own. No wonder it’s crowded up there.